Kidney being flushed before transplantation into William Ashley. 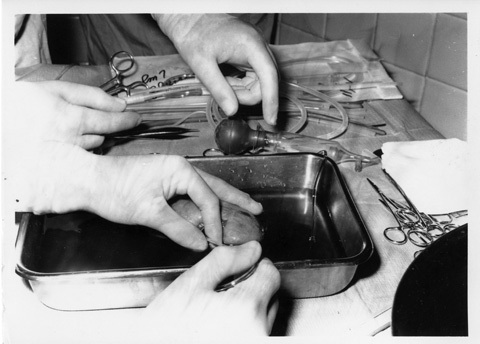 On December 3, 1968, the Medical College of South Carolina (MCSC) performed the first major organ transplant in its history and the first in the state of South Carolina. The kidney transplant was performed by a team of doctors who, in the years and months preceding the operation, developed an innovative procedure that addressed the body's acceptance or rejection of foreign matter. The following exhibit tells the story of this extraordinary event through oral history interviews and archival records. We hope that online visitors will come away with an appreciation of the significance of the operation and of the many contributions made by physicians, researchers, nurses, lab technicians, and support staff.